Hi, I am Melanie better known as Mel, I joined this wonderful group of ladies in 2013 and I have found I love everyone of them. My love of horses was in my blood from birth and I started riding before I could walk. My family will tell you that in my world it has always been animals first and then family. 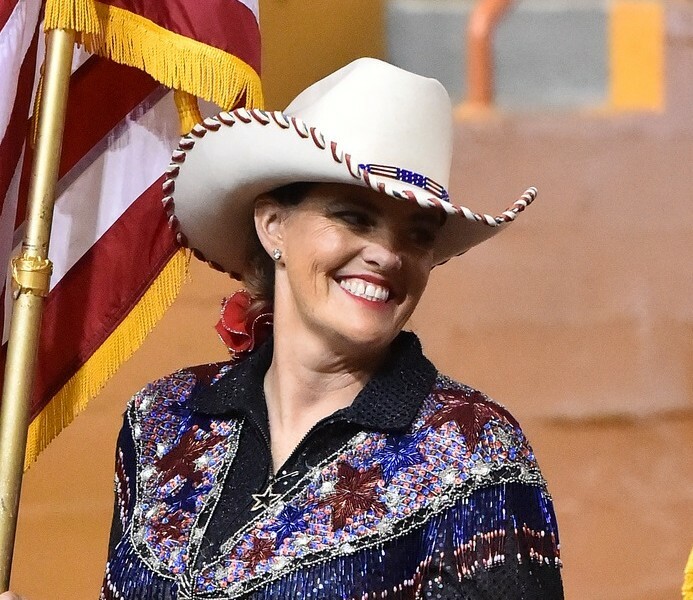 I love to ride drill, my husband and family are my biggest supporters and in 2016 I was give the great privilege of taking on the "Captain" role for the California Cowgirls. My drill partner and go-to guy is a American Quarter Horse named Lonesome. He is very much a ladies man (horses and humans) and a crowd pleaser, he has a very easy going nature that makes my job as captain easier. My second drill horse is Diamond a American Paint Horse who is an amazing animal, his personality is a little between Mr. Ed and a 2 year old. He is a nosy animal and into everything and everyone business, but his flashy color and blue eye make him a crowd favorite.